As soon as I made this dish, I looked at the end result and thought, "It's a Whoopie Pie!" As I dearly adore them, this added to the pleasure of eating this dish, so I'll always think of this as eggplant Whoopie Pie. I enjoyed this recipe, as did my husband. However, he said that it reminded him of a souffle, and he's not crazy about them. So, he liked it, but it wasn't substantial enough for him. I loved it (I like souffles). This was very quick to make. In fact, have everything ready because once you start cooking, it all goes like the wind. 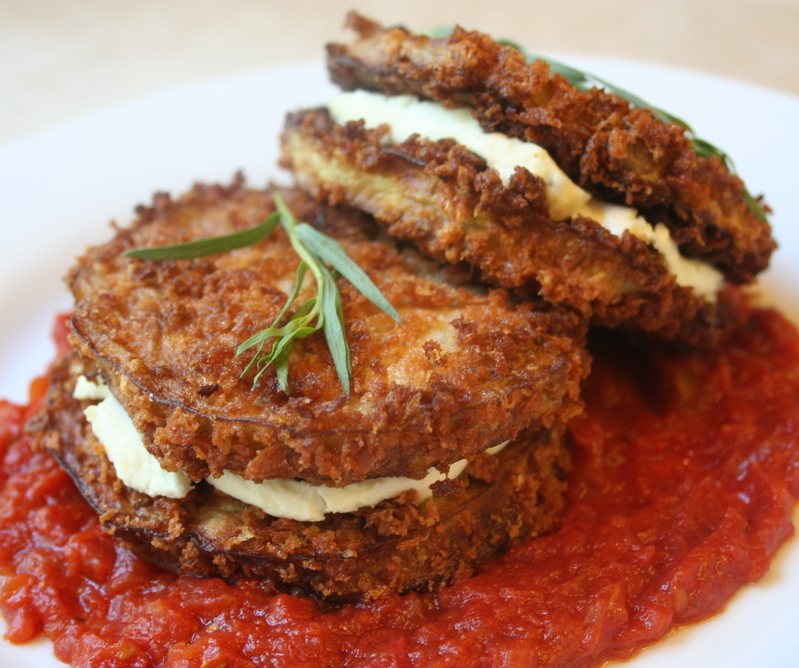 The dish has great contrasting tastes of sweet tomato sauce, crunchy panko crust, soft eggplant and creamy goat cheese. The tomato sauce has the surprise seasoning of tarragon, rather than the expected sweet basil. It adds a sweet anise flavor that makes the dish distinctive. Of course, you could substitute the basil, but I will always make this with the tarragon. I offer this wonderful recipe for Weekend Herb Blogging, which was created by the amazing Kalyn of Kalyn's Kitchen. This week WHB is being hosted by one of my favorite bloggers, Susan at Food Blogga. Go to her excellent site and see the Roundup of herby recipes by bloggers around the world. Over a month ago, I cleared the eggplants bushes from my garden, but overlooked removing two of them that were planted in a box along the side of the house. Since then they've been out of sight, out of mind, totally neglected and getting no water until it rained last week. A few days ago my mental fog lifted and I remembered them. I was amazed to see that they were doing pretty good, covered with blossoms and some eggplant fruits. These are determined plants and I'll let them keep at it. I also decided to honor the eggplants with a special dish. And I knew exactly which recipe to use. 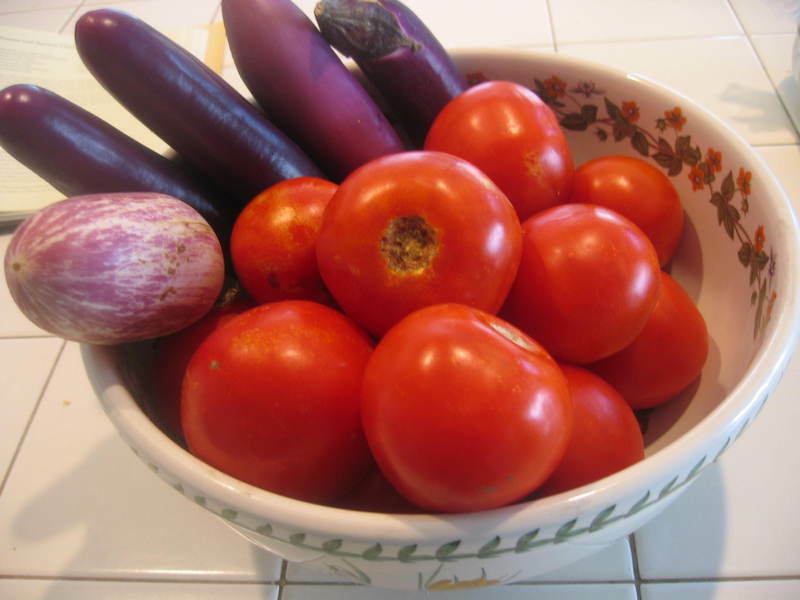 During the summer I planned making Deborah Madison's Eggplant Gratin With Saffron Cream. But, it never happened. Now was the time, with the Survivor Eggplants. As this recipe includes saffron, that makes it a good entry for Weekend Herb Blogging, created by Kalyn and hosted by this week by Meeta at What's For Lunch Honey. The saffron gives the custard topping a lovely golden hue, as well as a distinctive honey flavor. Last week, I incorrectly stated that this weekend is the one year anniversary of WHB, which was created by our Kalyn. Wrong! It's next weekend, so if any of you would like to take part, you have a whole week to come up with a dish and join in the festivities. Go to Kalyn's site and she will give you all the info on how to be an herb blogger. Try it--you'll like it. I picked the last of my eggplants this week and wanted to use some of them for WHB. Yesterday, I fixed a very simple dish of fried eggplant and walnut sauce from Deborah Madison's cookbook, The Savory Way. I think the dish took less than 15 minutes to make, and if I had made the walnut sauce in advance, it would have taken much less time than that. 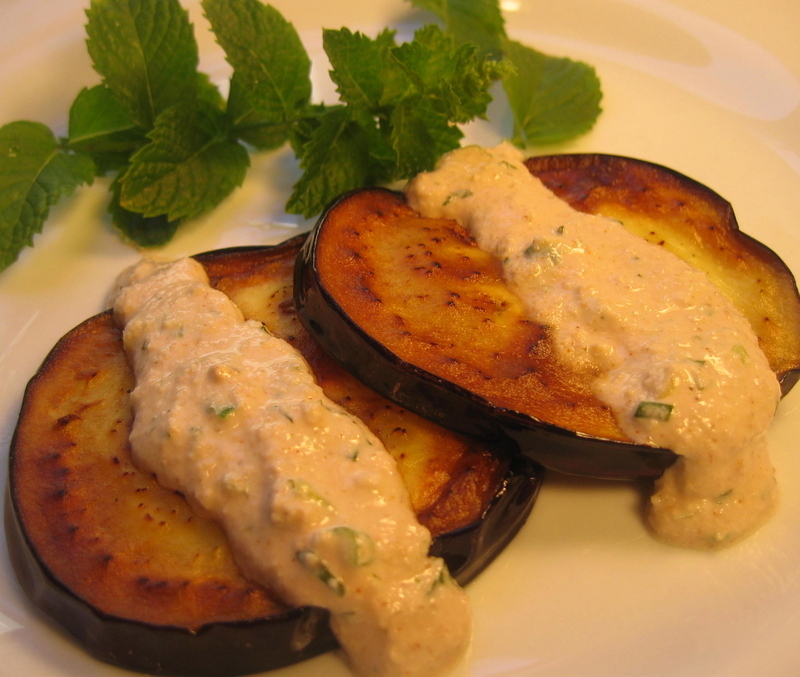 The sauce is wonderful and very healthy, as walnuts contain lovely omega-3 oil. It's taste can be changed according to the herbs you choose to add to it. In this case, I used mint. 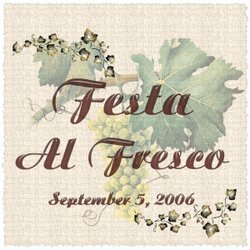 Some time ago the lovely Ivonne, of Creampuffs In Venice, and Lis at La Mia Cucina issued invitations to a grand party, La Festa Al Fresco. Time was running out for me, but I believe I just made it under the wire in time for the festivites. The invitation asks that the guests bring a dish that includes a fresh ingredient from their area, so I decided to use the Chinese eggplants and tomatoes that I harvested from my garden. And the perfect recipe for that is in one of my favorite cookbooks, The Mustards Grill Napa Valley Cookbook. And really, don't you think that Mustards Grill should treat me to a nice meal gratis? I have certainly sung the praises of this cookbook for some time. In any event, do not be dissuaded by the dismal photo of the finished dish, Curry Chicken Skewers With Eggplant Relish and Tomato Chutney Vinaigrette. It's full of flavor and a lot of fun to eat. Since there are so many people coming to the party, I thought they might like a nice skewer to wave around as they talked. There's nothing like pointing a sharp skewer at someone to make your point. 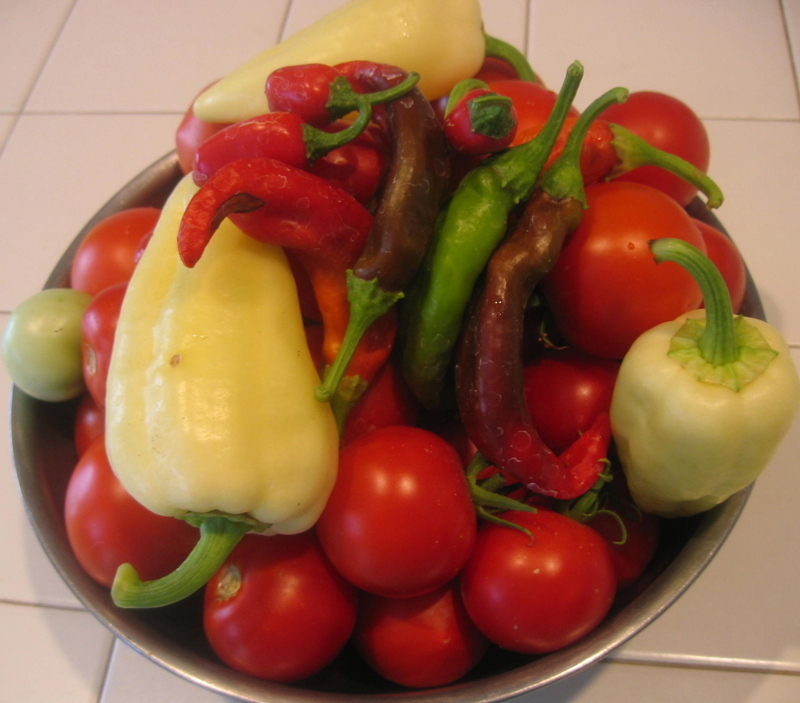 Summer is trickling away, but my garden continues to pump out a steady supply of eggplant, tomatoes, and peppers. But, I'm becoming more and more aware of the fact that in a couple of months all of this will be a pleasant memory, and the long wait until next year's harvest will begin. So, I enjoy every dish I make with these gifts from my garden, knowing I will miss them very much when they are gone. 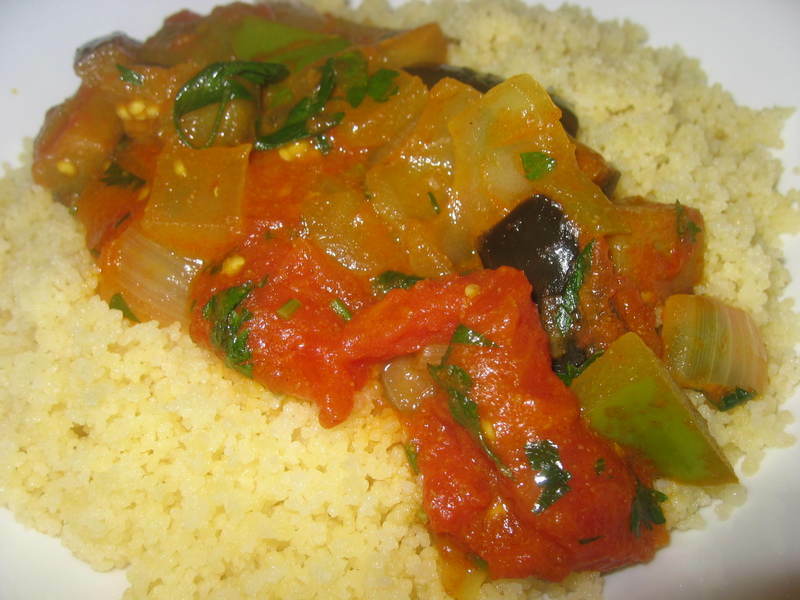 Yesterday, I made a eggplant stew, loaded with tomatoes and sweet paprika. Technically paprika is a spice, so I'm stretching things by using it as a springboard for Weekend Herb Blogging. WHB was created by the lovely Kalyn of Kalyn's Kitchen, and she allows us some leeway in these things. The recipe also contains that culinary workhorse, parsley. Parsley is hardly glamorous, but what would we do without it? I certainly notice its absence in any dish calling for it. The extreme heat is gone now, but it left some of my garden in tatters. For the first time ever, my green and wax beans are not giving me a good harvest. The few beans that I've managed to pick are stunted little things. Fortunately, I'm getting lots of tomatoes, peppers and eggplant. The eggplants seem to have weathered the extreme heat the best, with no blossom drop. I'm growing the standard black globes, as well as white and Chinese varieties. However, my favorite is the small purple variegated type. Not only are they pretty, but I think they taste better, with a sweet, creamy texture. They're also very prolific, covering the plants with fruit, so I'm able to harvest many of the little devils when they're only a little bigger than my finger. 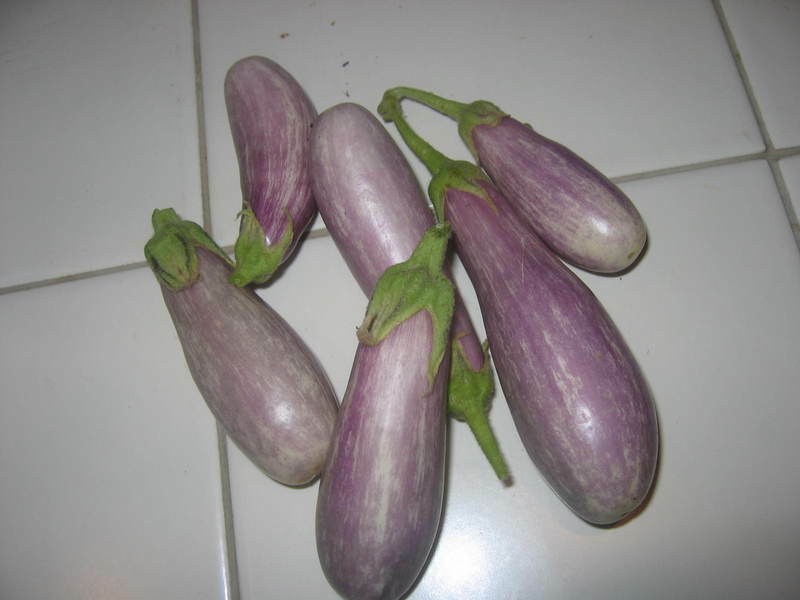 For some lovely pictures of this type of eggplant, go over to In Mol Araan. I was 12 years old when first introduced to eggplant. My mother was slowly making her way through Julia Child's French Chef cookbook when she announced that we would be making an odd sounding dish called ratatouille, made with eggplant and zucchini. Despite my misgivings, I helped mom prepare the dish and was surprised to find that I liked it very much. I still have my mother's tattered and food stained copy of The French Chef, and that's the recipe I still use to make ratatouille. It's a great recipe and I always think of that first time we made it together. I follow Julia's recipe faithfully, with one exception. I add some sprigs of thyme to it, because I love the taste of thyme and the woodsy note it adds to the dish. 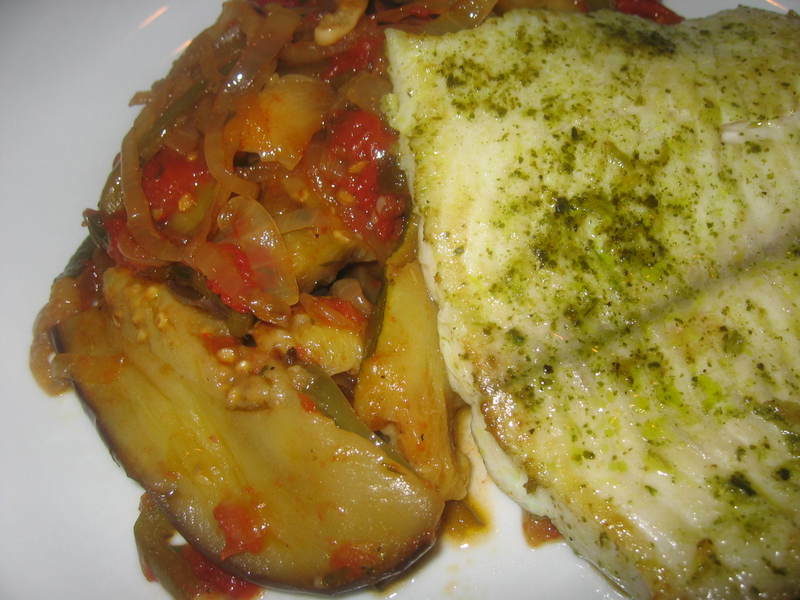 Although I used pesto on the fish that accompanies this dish, thyme is my featured herb this week for Weekend Herb Blogging. Several months ago, I planted some common thyme, which is traditionally used for cooking, and it's a handy thing having ready access to one of my favorite herbs. And it's cheaper to grow it than buying a big bunch of thyme at the grocery store, which usually goes to waste. If you do plant thyme, make sure it gets full sun. Thyme develops a fungus easily if it doesn't get enough sun and good air circulation. This week WHB, which was created by hard working Kalyn, is being hosted by the lovely Paz. Thank you Paz! Go over to her site and see what all the other herb bloggers are doing! This weekend I fixed one of my favorite recipes from The Green's Cookbook by Deborah Madison, Chinese Noodle Salad with Roasted Eggplant. 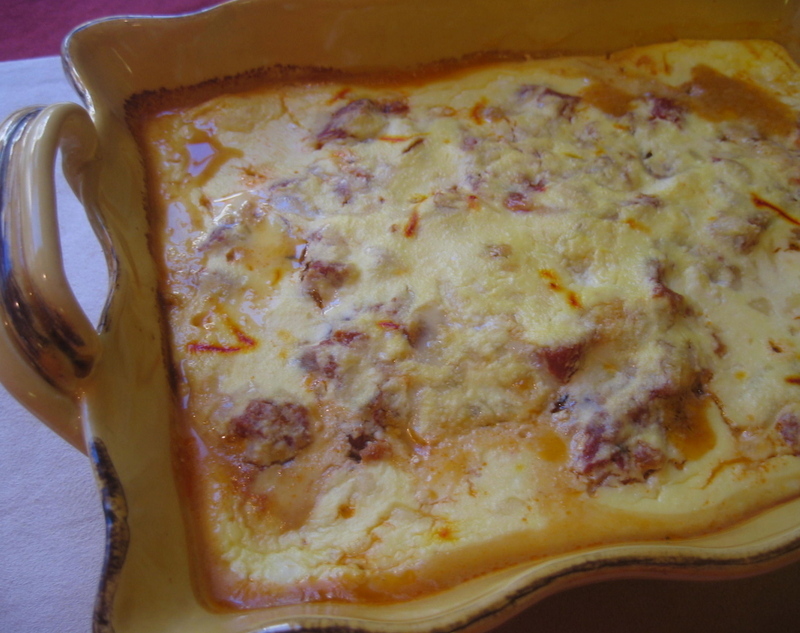 In the cookbook, it states that this recipe is one of the most popular dishes that the restaurant serves. That's quite an honor considering the fact that Greens has so many excellent dishes on their menu. The salad can be make ahead in segments, at your leisure. 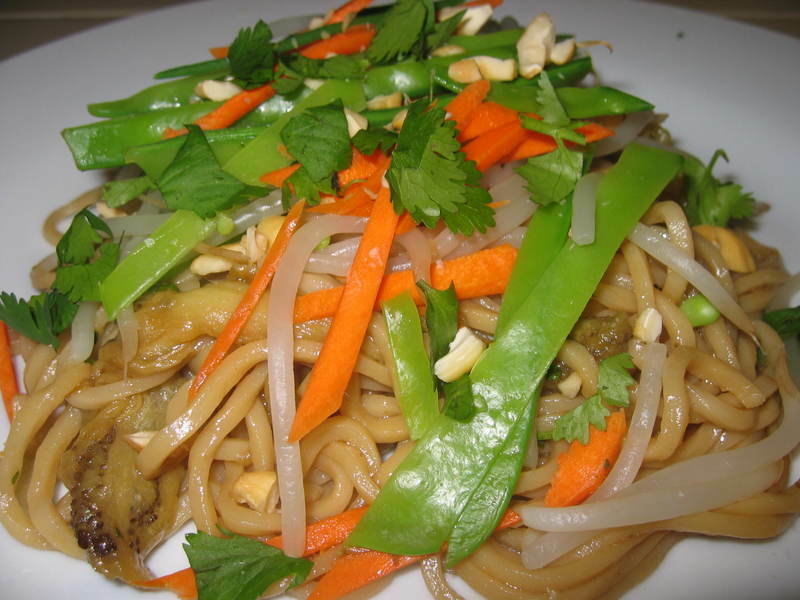 In fact, the noodles taste better if they're cooked as much as a day before you complete the salad. Then you can add the vegetables just before you serve it. Yesterday, I noticed that the interval between the times we eat meat has gotten longer. I mentioned this to Bob and he informed me that he could give it up completely, and never miss it at all. If I ever went that route, I would still eat seafood. And cheese. I have to enjoy a Mt Tam cheese now and then. This recipe for eggplant and potato stew was very good, and it allowed me to play with my new Penzey's herbs and spices. It calls for cumin seeds, bay leaf, garlic, fresh ginger root--but no meat. (I grew up in a house where eating stew always meant there was beef in it.) The smell of all the ingredients as they cooked in this meatless stew was wonderful. They permeated the entire house for hours, the best air freshener possible.